Some days, I really, really just want dinner in a hurry. I actually don’t keep food in a box in my apartment. It forces me to make real food. One of my best tricks? Steak dinner in 15 minutes. 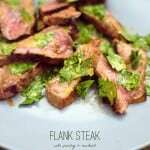 Seriously good food with flank steak, parsley and some pantry ingredients. This dish doesn’t require much finesse – you just need to be able to heat a skillet, roughly chop some herbs and whisk together some sauce. And then you toss it together. That’s it. Easy peasy weeknight dinner. 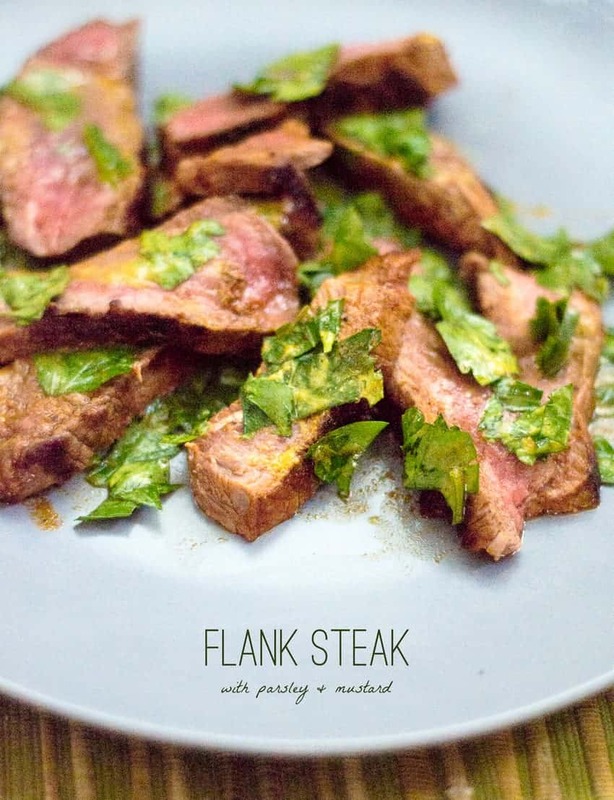 You can even roast some asparagus or make a salad while your flank steak cooks. It will make your Instagram friends jealous. And your real life friends might just show up for dinner. Drizzle your steak with olive oil and sprinkle with the paprika, salt and pepper on each side (make sure you rub the seasoning into your steak). Set a cast iron or grill pan over high heat, and make sure it is hot before adding the steaks. While they cook, roughly chop the parsley leaves and finely chop the stalks on a cutting board. Add the mustard, lemon juice, olive oil. Season with salt and pepper and mix together, either on your cutting board or in a bowl. (It is perfectly acceptable to just smush it around on your cutting board). If you mix it in a bowl, spread it on your serving plate. Slice the cooked steak and toss with the sauce. Serve with a salad or some quick-cooked veg. This entry was posted in Main Dishes, Paleo Friendly, Recipes, Recipes & Techniques by Cooks We Love and tagged FrannyCakes, gluten free cooking, gluten free diet, gluten free food, paleo, paleo recipes. Bookmark the permalink.